THE REVIEW: Few things are more entertaining to watch than a wonderfully crafted conspiracy theory, especially one as well-crafted as Oliver Stone’s take on John F. Kennedy’s assassination in 1963. When it comes to a film like JFK, I’m less interested in what actually happened (or what was claimed to have happen by the Warren Commission), and more with how “facts” are used to construct a logical reasoning for an alternative outcome. Journey would be an appropriate word to describe JFK; so would exploration or examination. A journey to find the truth, to find answers, to find a reason for what happened. We may never know is the Warren Commission report is correct in identifying Lee Harvey Oswald as the lone shooter, if indeed there was a conspiracy and multiple shooters as Oliver Stone’s film suggests, or if there is some other answer entirely. 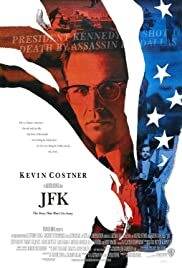 For the purposes of this film all you need to know is that New Orleans District Attorney Jim Garrison (Kevin Costner) presents a convincing argument, an argument that is well-crafted and presented in a way that will hold your attention longer than I thought possible. Despite a three-plus hour runtime, JFK never skips a beat and always keeps you guessing and on your toes. True or false, accurate or manipulative, JFK is an entertaining piece of filmmaking.